EA Sports FIFA Football on PS Vita delivers the first true next generation football experience in the palm of your hands. 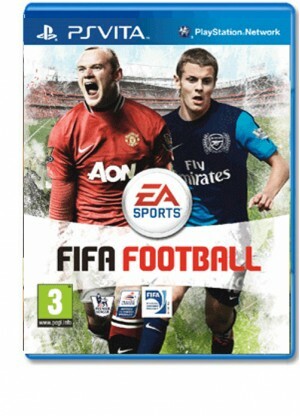 Enjoy the award-winning FIFA console gameplay, HD graphics, and the largest feature set ever created by EA SPORTS for a handheld device. The same physics-based, data driven technology that powers FIFA gameplay on PlayStation3 drives FIFA Football on the Vita across eight different game modes, including authentic 11 versus 11, Be A Pro, Tournament Mode with over 50 real-world competitions, a full in-depth Career Mode, and head-to-head online. Innovations that utilize front and back multitouch screens create an intelligent and unique gameplay experience. Touch Screen Shooting delivers pin-point accuracy and removes the element of “hit and hope” from shooting, Touch Screen Passing opens up the field of play for more creative, precision passing, and Touch Screen Free Kick Control enables players to swipe a finger to aim and curl the shot around the wall. Plus, compete with over 500 officially licensed clubs in 11 v 11 matches in authentic stadiums from around the world.